Enjoy two top-quality extra virgin olive oils from renowned Spanish producer, Almazaras de la Subbética. 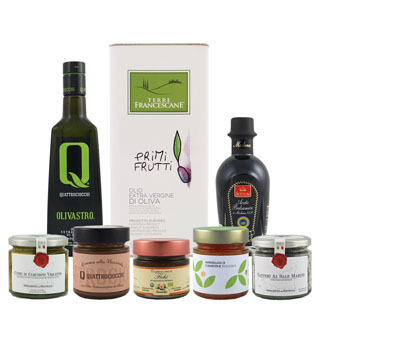 This unique gift box includes both the award-winning Rincon de la Subbética and Parqueoliva Serie Oro extra virgin olive oils as well as a detailed informational booklet. Rincon de la Subbética: One of the top 50 Best Olive Oil in the World, this 100% Hojiblanco extra virgin olive oil is intensely fruity with aromas of herbaceous plants, thyme and mint with prominent notes of tomato and garden vegetables. The taste is initially sweet with a green almond flavor and a moderately spicy finish. This fragrant oil is best when paired with heavier meals that are rich in flavor. Drizzle over toast, mixed salads, tomatoes, meat and oily fish. Parqueoliva Serie Oro: An extraordinarily well-balanced oil with aromas of intense green fruit such as apples and green banana along with vegetal notes of tomato and artichoke, fresh-cut grass and green almonds. On the palette, the oil is sweet with notes of green almond and has a delightful pungent finish. This oil is ideal for carpaccios, pastas, sauces, meats and white fish.